B for Bag travel luggage tips are for all travelers. We have already covered how to choose the right luggage for your trip and how to pack your bags. In this section, we offer various additional advices about travelling with a bag. We look at how to pack carry-on bag for your flight and explain luggage regulations. We explore airport security restrictions and look at what you can and cannot bring aboard an airplane. We go through why you should take luggage insurance when travelling and what it should include. 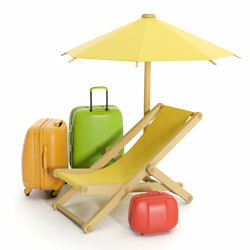 We also look at which factors affect the price of your travel insurance. We explore what happens to unclaimed luggage and how to avoid losing your luggage in the first place, as well what to do if you lose your bag, e.g. if your airline looses your bag. We also look at what to do if your bag is damaged by the airline. Furthermore, we offer direct links to various official websites for further practical information. What Are The Luggage Regulations For Flights? If you have a travel luggage tips you like to share with our readers or any questions or ideas about what you would like us to cover, please use our Contact Form and we will come back to you as soon as we can. However, if you are interested in general travel advice and information, why not check our sister website TopTravel Tips . There you can find practical travel advice that can save you both time and money when travelling.